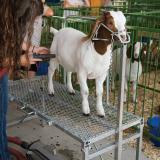 Our trimming stand keeps animals secure while you trim at a comfortable height. For clipping, shearing or foot trimming sheep and goats. 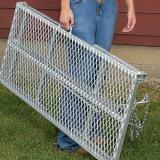 Securely holds polled or horned sheep and goats (chain fits around back of the animal’s head). 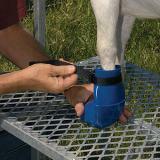 Easy-to-turn thumbscrew for quick adjustments between tall or short animals. Fits everything from Shetlands to Suffolks. Hot-dip galvanized for years of use. Folding carry handle prevents legs being caught. Need a milking stand? We’ve introduced a milking headpiece that fits neatly onto our trimming stand to securely hold nannies at a comfortable height. Animals are restrained at a comfortable level for the user. 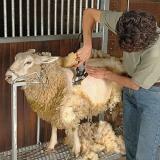 Allows a free hand for new shearers to use shearing machines or hand shears. 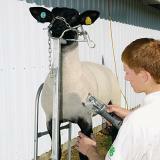 Fine tune your show animals appearance with a 4000c clipping machine and small clippers, or get the right shape with wool cards. Focus on fitting the animal and not holding them still. Having an elevated animal makes foot trimming much easier. Pinchers, knives and trimmers can be deftly used with lowered risk to animal or user. Again, saves your back and body from stress or strain. 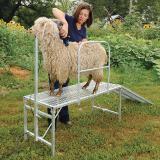 Folding carry handle on the stand and ramp prevents sheep from getting their legs caught. Stronger mounting points for the side rails (old style could easily be bent if stand was dropped on them). 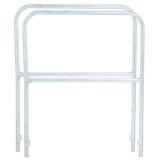 Side rails extend further into mounts to prevent them from coming out when leaned on. Better fit of headpiece in the stand (old style tended to be loose). Improved headpiece securing bolt (easier on the fingers than old style). 48" long x 20" wide. 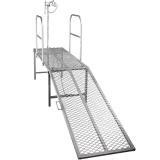 Includes the headpiece but not the ramp or side rails. Stands 22" off the ground. 1" x 1" square tube is 43" long (measured from the bottom of the headpiece). 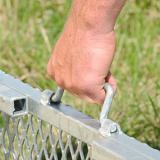 Thumbscrew enables users to adjust the front vertical bar up or down to fit most sheep or goats. 25" tall x 21-1/2" wide. Side rails fit securely to the stand to reduce animal movement. Reduces risk of accidental falls from the platform. 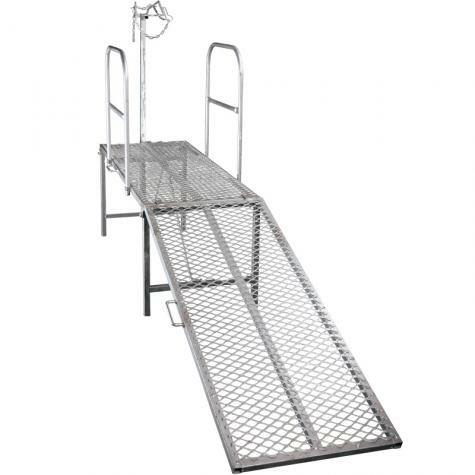 Reduces effort and risk of injury to both animal and user (often encountered when lifting animal onto a stand without a ramp). 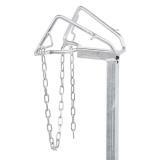 Ramp hooks directly into the diamond mesh on the trimming stand floor. Compare ours with others. We challenge anyone to match Premier's combination of cost and quality. 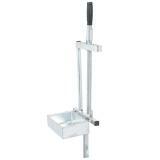 Great for cutting tough hooves of larger sheep and goat breeds. Best hand trimmer (in value, ability and quality) for large hands. Serrated blades slice through hard, dry hooves with ease. Comfortable grip for all hand sizes. 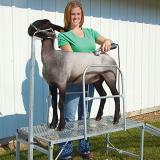 Popular shear for fitting show sheep. 6.5", double hollow ground blades. 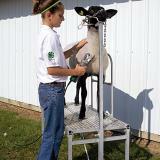 Short blades are handy for close trimming in tight areas around legs and the head of animals. Also useful for crutching. Made by Burgon & Ball. 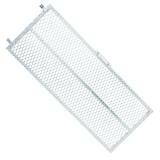 Number of reviews: 67 customers reviewed this product. Recommended: 66 out of 67 said they would recommend this product to a friend. 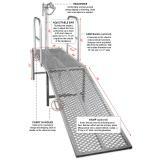 I purchased the stand and side rails but didn’t purchase the ramp as of yet. I only got to use it a couple times so far but works great I leave both side rails on when trimming hooves plenty of room to work around. I will probably get the ramp would make it easier for smaller goats to get on stand my big buck just jumps up. I’m 6’4 and it is a comfortable height for me to work on them. Received in a timely manner, and we are very happy with the quality. Very well built. Really makes trimming toenails much easier. A bit tough to secure a short nosed goat, but likely our technique shortcomings vs equipment. Love it! Great investment. Heavy duty, but the pieces individually are not to heavy for this disabled female to lift. I run Nigerian Dwarf for milk and they liked it just fine as well. I LOVE these rails. These are the only ones that have a center bar for young stock!